We provide award-winning winter gritting services with an extensive network of depots and local teams across the north. We are centrally based in Leeds and with an extensive footprint. We offer Full Liability Protection backed up with a guaranteed service which has been tried tested against the toughest of winter weather. 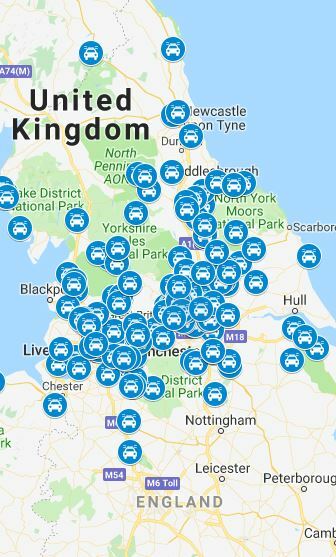 As you can see on the map to the right, our local GRITIT™ teams are available for gritting, de-icing and winter services and cover Cheshire, Staffordshire, Merseyside, Halton, Warrington, Greater Manchester, Blackburn, Lancashire, Blackpool, Derbyshire, South Yorkshire, West Yorkshire, North Yorkshire, York, East Riding of Yorkshire, Cumbria, Durham, Northumberland, Tyne & Wear, Darlington, Stockton-on-Tees, Redcar and Cleveland, Hartlepool, Conwy, Denbighshire, Flintshire, Gwynedd, Isle of Anglesey & Wrexham, with others in between. The map to the right shows our teams.... but each team covers multiple crews, each crew covering up to 25 different locations every day! With our network, the largest national network of gritting operatives, you can be sure that we're already doing work very near to you - and adding your site to a route we're already covering is perfectly doable and you'll benefit from our scale of operations. Please do not hesitate to contact me directly so that I can dispatch one of our crews local to you over to your site. Order your winter services in time!